Union Major General Ambrose Burnside, commander of the Department of the Ohio, undertook an expedition into East Tennessee to clear the roads and passes to Virginia, and, if possible, secure the saltworks beyond Abingdon. In October, Confederate Brig. General John S. Williams, with his cavalry force, set out to disrupt Union communications and logistics. He wished to take Bull's Gap on the East Tennessee & Virginia Railroad. In attempting to take Knoxville, the Confederates decided that Fort Sanders was the only vulnerable place where they could penetrate Union Major General Burnside's fortifications, which enclosed the city, and successfully conclude the siege, already a week long. The fort surmounted an eminence just northwest of Knoxville. Union wire entanglements-–telegraph wire stretched from one tree stump to another to another-–delayed the attack, but the fort's outer ditch halted the Confederates. This ditch was twelve feet wide and from four to ten feet deep with vertical sides. The fort's exterior slope was almost vertical, also. Crossing the ditch was nearly impossible, especially under withering defensive fire from musketry and canister. After these troops had left, Major General William T. Martin, commander of General Longstreet's Confederate cavalry, now reunited, attacked the remainder of Sturgis's force at Mossy Creek, Tennessee, which included the First Brigade, Second Division, XXIII Army Corps, commanded by Col. Samuel R. Mott, at 9:00 am. In November 1864, Major General John C. Breckinridge undertook an expedition into East Tennessee, anticipating that Confederate sympathizers would join his force and help drive the Yankees from the area. The Federals initially retired in front of this force and, on November 10, were at Bull's Gap on the East Tennessee & Virginia Railroad. The Confederates attacked them on the morning of the 11th but were repulsed by 11:00 am. Artillery fire continued throughout the day. The next morning, both sides attacked; the Confederates sought to hit the Union forces in a variety of locations but they gained little. The next day firing occurred throughout most of the day, but the Confederates did not assault the Union lines because they were marching to flank them on the right. Before making the flank attack, the Union forces, short on everything from ammunition to rations, withdrew from Bull's Gap after midnight on the 4th. Breckinridge pursued, but the Federals received reinforcements and foul weather played havoc with the roads and streams. Breckinridge, with most of his force, retired back to Virginia. This victory was a temporary Union setback in the Federal plans to rid East Tennessee of Confederate influence. Following a failed Confederate assault on Bull’s Gap by troops under Maj. Gen. John C. Breckinridge on 12 November 1864, the Union commander in the Gap, Brig. Gen. Alvan C. Gillem, determined to evacuate the Gap the next night. Alert Confederate scouts noticed when Union troops abandoned Taylor’s Gap southwest of Gillem’s position, a fact they immediately reported to Breckinridge and his second-in-command, Brig. Gen. Basil Duke. Breckinridge hoped to find Gillem strung out on the road to Russellville and pushed his troops through Taylor’s Gap and rushed to Russellville on the Warrensburg/Arnott Road. Gillem, moving up to Whitesburg on a parallel turnpike and hearing that Union reinforcements had arrived at Morristown, sent word for the new troops to meet him in Russellville. There, he placed two battalions of dismounted cavalry in separate supporting positions in case the initial line was overrun. At 1 a.m. on November 14, Breckinridge attacked Gillem’s Union battalions in Russellville and sent them reeling west towards Morristown, capturing many prisoners in the woods. The second line of troops held the charging Confederates until ammunition ran low. At that point, the entire Union force streamed back to Morristown, where it rallied behind the new regiment sent to reinforce them. After capturing a single artillery piece on a knoll, rampaging Confederates broke the Federal line once more. 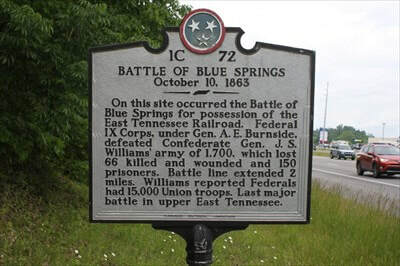 This time, pursuing cavalrymen chased Union survivors all the way back to Strawberry Plains, a distance of 25 miles. Gillem, separated from his troops during the charge, made his way to the Plains by a side road and rejoined his shattered command, minus several hundred men lost mostly to capture.